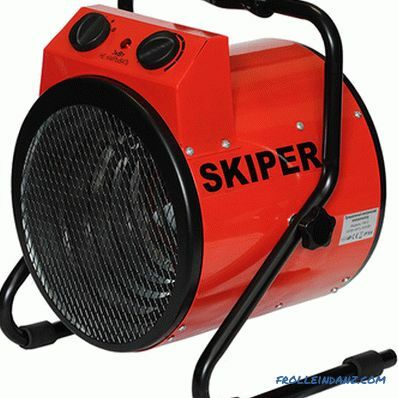 If you need to quickly heat up an unheated garage (workshop, cabins, warehouse, workshop, hangar, etc.) to create comfortable working conditions there, if your house is connected to central heating, but the batteries are barely winter living, if due to the high humidity and low temperature, the repair and finishing work in the room was stretched indefinitely, if you with an enviable regularity need to warm up a car refusing to wind up in the cold, you cannot do without a heat gun. However, given the fact that the range of these devices today is simply huge, understanding how to choose a heat gun is a very difficult task. But after studying this material, you can find exactly the heating device that will be most effective in solving the problem. Cost of the heat gun. Constructional heat guns are fairly simple devices, the main components of which are the housing, the heating element and the fan. On the body of the gun, made of metal, which helps prevent both thermal and mechanical damage, there are openings for air intake. The body may have a rectangular shape, but cylindrical heat guns are more common. Thanks to this form, which gives rise to associations with the barrel of an artillery gun, this type of air heaters got its name. To increase mobility, rather massive and heavy devices are placed on a frame equipped with maneuverable wheels. Inside the case there is a heating element (electric heater / helix or a combustion chamber with a heat exchanger) and a powerful motor-driven fan. The fan forces cold air through the holes in the body into the gun, drives it along the heating element and contributes to the distribution of the already hot air in the room. 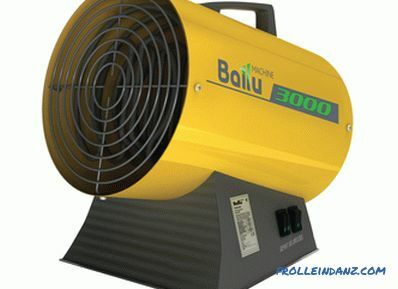 Thus, the heat gun is essentially a powerful fan heater. Below we look at each of the above types of heat guns, talk about their structure, principle of operation, main areas of application, advantages and disadvantages. Either a metal spiral or a tubular electric heater can act as the heating element of an electric heat gun. The second option is preferable, because TENs, although they are a little more inertial, but unlike open spirals, they last longer and are safer to use. The fan blows air into the gun. The temperature of the air mass passing along the heating element or helix gradually rises, and the already warm air flow is directed into the room. To prevent overheating of the device and save energy, electric heat guns are equipped with a thermostat that automatically turns off the heating element (but does not turn off the fan) when the temperature reaches the maximum allowable (or user-defined) value. 8. Electrical unit with cable entry, control buttons and thermal limiter. One of the main advantages of electric heat guns over heaters operating on combustible fuel is their environmental friendliness - when such devices do not produce exhaust gases or any other waste. For this reason, electric guns can be considered universal in terms of applicability. 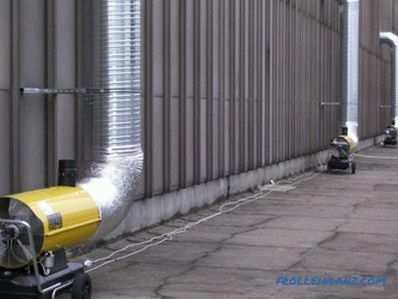 They can be used to heat both residential and non-residential premises in which people are constantly present (workshops, workshops, train stations, shops).In addition, unlike liquid-fuel guns, electric is easy to “run” even at very low temperatures, and therefore they are successfully used in unheated garages, in cold warehouses, etc. The undoubted advantages of electric heat guns can be attributed to an arbitrarily long continuous work and no need for periodic refueling. Gas heat guns operate on gas supplied through a reducer from a cylinder (propane, butane) or a centralized gas network (natural gas). Through the slit-like openings of the burner, the gas enters the combustion chamber equipped with a mechanical or automatic piezo ignition system. Burning, it heats the heat exchanger. The air blown by the electric fan passes along the heat exchanger and, in contact with its hot walls, also heats up. The presence in the design of a gas heat gun fan dictates the need to connect the device to the mains, but the power consumption is relatively small - from 30 to 200 watts. 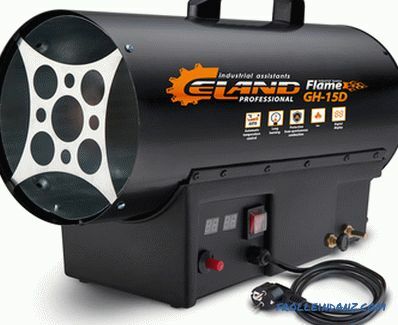 Gas heat guns are powerful devices that provide an economical, but fast heating of large areas. However, in spite of the fact that in most cases modern gas guns are equipped with an automatic flame control system and protection against overheating, they still remain potentially dangerous units. In addition, in the course of their work, an inevitable burnout of oxygen occurs, and if there is no ventilation in a heated room, after some time it begins to affect the well-being of the people there. With this in mind, such heaters, as a rule, are not installed in residential premises, their main "sphere of influence" is large objects of closed, semi-open and open type. Most often, gas heat guns can be found in warehouses and large production facilities, in hangars and on construction sites. 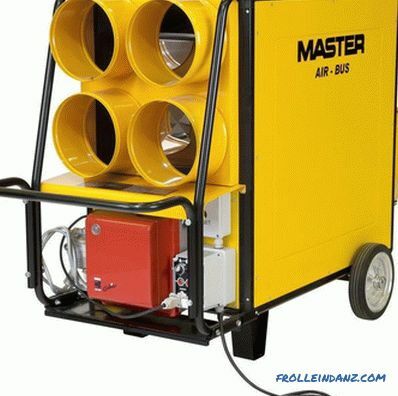 There are two types of diesel air heaters - direct and indirect heating. The former are more efficient, the temperature of the air leaving them is higher, and all other things being equal, they are able to warm the room faster. This is achieved due to the fact that the heated air passes directly through the combustion chamber. 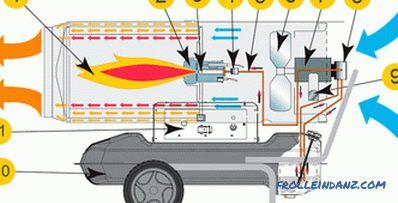 It is clear that the combustion products of diesel fuel along with warm air enter the room. For this reason, such heat guns are forbidden to use in areas where people are constantly located. 9. Strap for winding the cord. 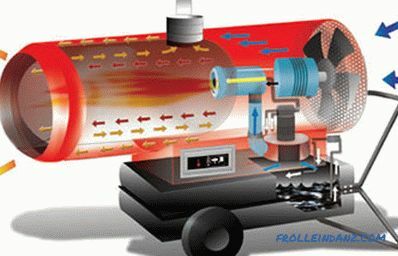 In indirect heat heating guns, there are no such restrictions, because there is an isolated combustion chamber (i.e., the air is heated only as a result of contact with its hot walls), and the combustion products are discharged along specially equipped chimney. However, reducing the level of air pollution in a room in this case costs at the cost of a drop in efficiency. 10. Strap for winding the cord. The main structural elements of a diesel heat gun are the fuel tank, the combustion chamber and the electric fan. 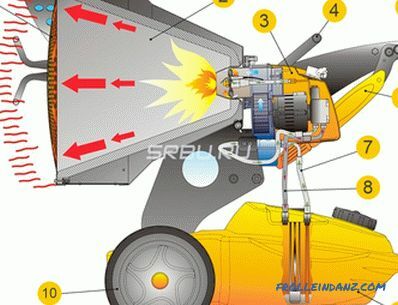 Fuel pumped by the pump is fed from the fuel tank to the nozzle, spraying it through the combustion chamber. There the resulting fuel-air mixture is ignited using a piezo ignition system. 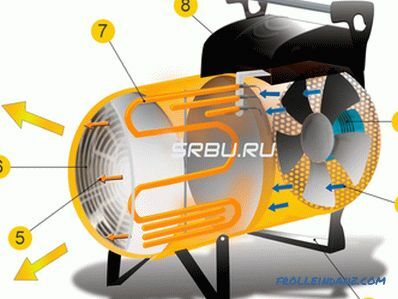 The air directed by the electric fan passes along the combustion chamber, due to which it heats up. Heat guns that are to be used offline should be equipped with a timer and a flame control system. 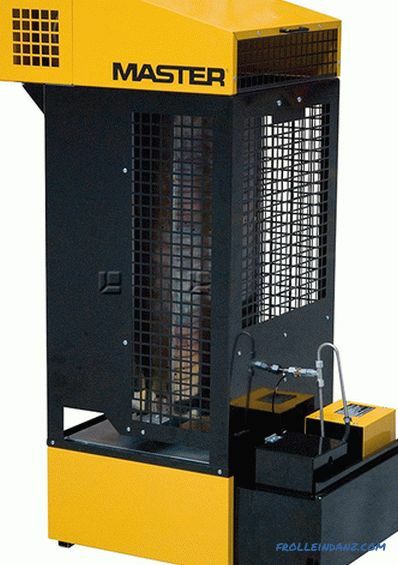 When using diesel heat guns, the heating of the room is due to the energy released during the combustion of diesel fuel.Such heaters are often used on large construction and production facilities - in hangars, warehouses, factory workshops, etc. 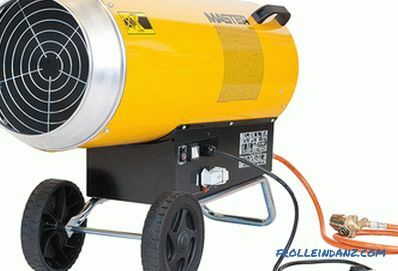 Diesel heat gun of direct heating mounted on wheels. 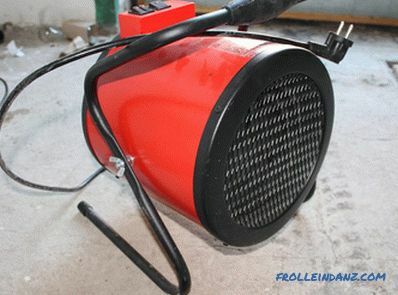 Portable diesel heat gun of direct heating. 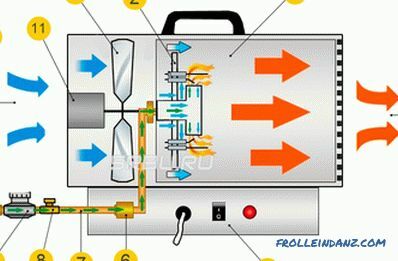 Diesel gun of indirect heating. 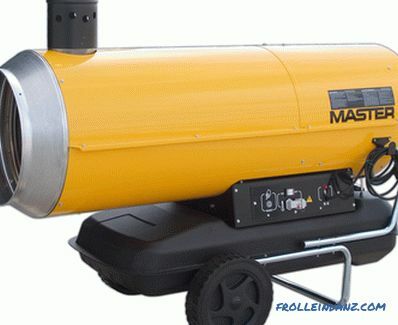 Diesel gun of indirect heating, high power. Multi-fuel heat guns do not differ much from diesel ones. And just like diesel, they are divided into direct and indirect heating devices with the same pros and cons. Multi-fuel heat guns are more versatile than diesel ones in terms of the diversity of fuel they can work on. With great pleasure, they "absorb" not only diesel, but kerosene, and even waste oil. That is why such heat guns are especially popular at car-care centers, because there they help “to kill two birds with one stone” - to warm the room and utilize the mining. Infrared heaters are a private house among the heat guns, because they are fundamentally different from all the types discussed above. The heat generated by such a heater reaches the surface to which the gun is "aimed", not in the form of a stream of hot air, but in the form of radiation. The heated surfaces of walls and individual objects that fall into the radiation zone transfer their heat to the surrounding air. The rate of air heating in this way is significantly less than with the help of fan heaters, and whether the heating will be general or local only depends on the size of the room. However, being in the radiation zone becomes comfortable for a person in the very first minutes of the heating device operation. The main structural elements of an infrared heat gun are a fuel tank, a torch with piezo igniter and a reflector that reflects and directs the infrared radiation in the right direction. A fan is not needed for such a heater, because its principle of action is not based on forced convection of warm air, like other types of heat guns, but on energy transfer through electromagnetic waves. 5. Blockade of the hinge. 6. Lever for moving the heater. 8. Fuel line for fuel return. IR guns are used in rooms with poor thermal insulation and / or high ceilings (warehouses, workshops, garages, etc. ), as well as in open areas (street outlets, summer cafes, verandas ). 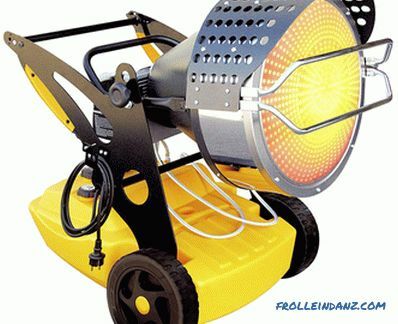 Often they are more convenient than fan heaters when carrying out repair and finishing works (for example, for drying plaster or paint), because heating the working surface directly is more rational than heating the entire room to the desired temperature. Residential and office premises are in most cases connected to a central heating system or they have their own autonomous heating system (with the exception of, perhaps, only country houses, not intended for permanent year-round living). Heat gun here may be needed only as an additional source of heat. The best option in this case would be an electric device - it is as simple as possible to operate, safe, environmentally friendly, and does not require maintenance. Many models are equipped with a thermostat that allows you to maintain the desired temperature in the room by automatically turning the gun on and off. 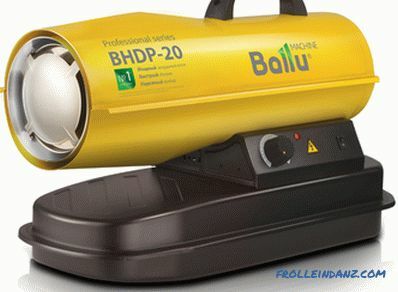 When using a heat gun in residential or office premises, an instrument with a capacity of up to 5 kW will be quite enough as an additional source of heat, all the more so that a standard 220V voltage supply is sufficient for connecting such a device. When carrying out internal repair and finishing works there is often a need for an additional heat source that will help reduce the humidity in the room and reduce The drying time of walls and other surfaces after, for example, painting or plastering. 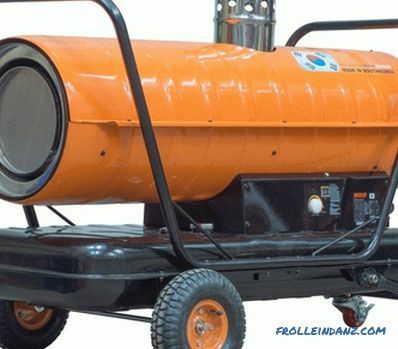 Diesel and multi-fuel heat guns will have to be excluded from the list of possible options, because it is impossible to use direct heating devices in closed rooms, and mounting the smoke exhaust system for an indirect heating gun for the sake of short-term use is simply inappropriate, and not always possible. The most optimal solution to the problem will be the use of an electric gun due to the simplicity of its operation. The option with a gas-powered device is worth considering if a significant amount of work is expected - this device is more efficient, but its use will also require a gas cylinder. A good option can be considered an infrared heat gun, which allows to heat only the work surface without heating the entire room to the desired temperature. However, in this case, you must be especially careful to ensure that the plastered or painted wall does not overheat, otherwise all work will go down the drain. Since the auto-repair shop is a closed type room where people are constantly living in, direct-fuel oil cannons cannot be used here. The entry of combustion products into the room will inevitably cause a deterioration in the well-being of the personnel working in the workshop, which means that it will require very effective forced ventilation, open doors and windows, which can negate all the efforts to heat the room. 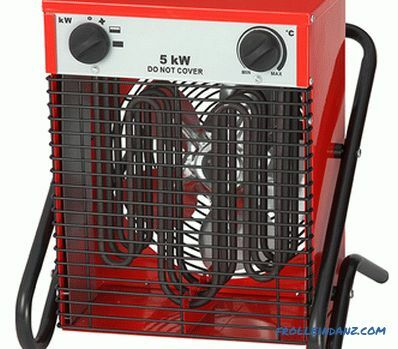 Electric heat guns, despite the simplicity of their use, are impractical to use in such buildings, since taking into account the high cost of electricity, heating a sufficiently large room is equivalent to kindling a stove with bills of currency. For heating indoor spaces of more than 300 cubic meters, the best option would be the use of gas, as well as diesel guns of indirect heating. In many auto repair shops they prefer to install heat guns working on waste oil, since this type of fuel is available there in large quantities and completely free of charge. But in this case it is necessary to remember about the need for mandatory installation of high-quality ventilation system to replenish the burnt oxygen. The most optimal way to ensure comfortable working conditions for warehouse workers is to use gas heat guns, as well as diesel guns of indirect heating (with mandatory installation of the smoke exhaust system). The use of electric guns is impractical here, since, given the large areas of storage space, this will lead to a significant increase in the company's electricity bills. In agriculture, heat guns are used quite often. With their help, heated greenhouses, poultry houses, pigsty, cowsheds, dried vegetables before putting them into storage. Both industrial gas and liquid-fuel heat guns are used for heating industrial greenhouses, since both of them, having a large thermal capacity, do a good job of heating large areas. At the same time, since greenhouses are not the place for a long stay of people, it is permissible to use liquid fuel heat guns there. 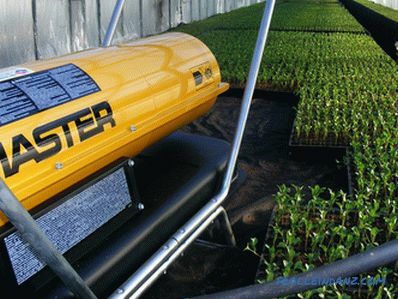 Those who are looking for a heating device specifically for industrial greenhouses will know that the Italian company Sial, one of the leaders in the world market of heating equipment, specifically produces the Airfarm series of heat guns for agriculture. They are designed for pendant installation, which allows optimal and convenient placement of the device in a greenhouse, and can be equipped with a thermostat to automatically maintain the required temperature. In this case, we recommend that you use a device that does not heat the air. flow and energy of radiation. Infrared heat guns are ideal for open areas, because the air is not heated, which is completely irrational outside, but the objects to which they are directed. IK-guns have one more indisputable advantage - the absence of unnecessary noise background, which will make your rest even more comfortable. Power is the main characteristic of heat guns, as, indeed, any other heating devices. The greater the power of the device, the faster as a result of its work the room will warm up with other things being equal. In order to avoid confusion, one should immediately make a reservation that this is a so-called thermal power, which characterizes the performance of the heating device, and not the consumed electrical power.The latter can be considered indicative only in the case of electric heat guns. Gas and oil heaters also consume electricity, but in them it is not spent on heat generation, but only on the operation of the electric fan and control and monitoring systems. The power consumption of such devices varies from several tens to several hundred watts and does not characterize them at all as heating devices. So, on the heat output, i.e., on the amount of heat that the heater can transmit to the air in the room per unit of time ... The power of the liquid-fuel (diesel and multi-fuel) guns can reach 200-220 kW, while the devices indirect heating is much weaker - among them there are few who can produce more than a hundred kilowatts. The range of variation of the thermal power of gas heat guns is from 10 to 100-150 kW, although more powerful stationary units are also found. 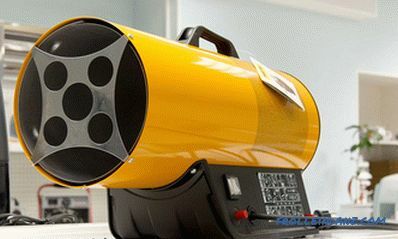 The maximum power of infrared guns - 40-50 kW. And, finally, the heat output of electric heat guns can vary from 1 to 50 kW depending on the model (however, among industrial stationary installations there are also more powerful ones - up to 100 kW). At the same time, many models have the possibility of stepwise control of the heating power in accordance with the needs of the user at the moment. 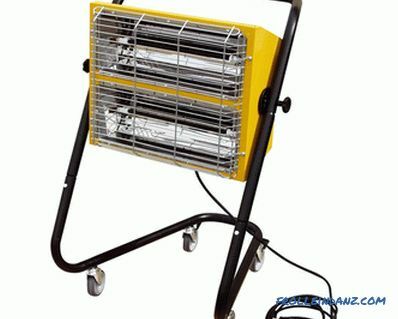 Electric heaters with a capacity of up to 5 kW are traditionally attributed to household, and more than 5 kW - to industrial. This distinction is due to the fact that household appliances can operate from a conventional single-phase 220V mains, while a more powerful three-phase 380V network is required. This limitation must be kept in mind when searching for a suitable heater. Before you choose a high-power electric heat gun, you need to find out if your facility has the ability to connect it. The movement of air mass during operation of the heat gun is carried out by the built-in electric fan. The more efficient the fan, the faster the warm air will be mixed with the cold air. On more powerful heat guns install more efficient fans. On the one hand, this prevents local overheating of air in the immediate vicinity of the gun, on the other hand, a powerful device is able to warm the entire room faster, and this opportunity should be used. This results in another characteristic of the heat gun - the air flow. The air flow (often referred to as the performance of heat ventilation equipment) is the amount of warm air generated by the heat gun per hour of its operation. The magnitude of this indicator, you can estimate the rate of heating the room to the desired temperature. Recall that infrared heat guns do not have a fan, and therefore such a characteristic as air flow is not applicable to them. The fuel for gas heat guns are lower saturated hydrocarbons, which are in normal conditions in a gaseous state. liquefied gas (propane or butane) transported and stored in cylinders. Gas is cheaper than diesel fuel and much cheaper than electricity. Moreover, in this case we are talking about liquefied gas supplied in cylinders, even firewood is not able to compete with the main gas at low prices. From this it follows that the use of gas heat guns, especially for heating large areas, is most cost-effective. Fuel oil heat guns work equally well on diesel and kerosene. Manufacturers strongly recommend using only these fuels. In order to avoid explosion, fire, equipment failure, it is strictly forbidden to use alcohol, gasoline, naphtha, or any other flammable liquids to refuel fuel guns. Care should be taken in the quality of the fuel used. 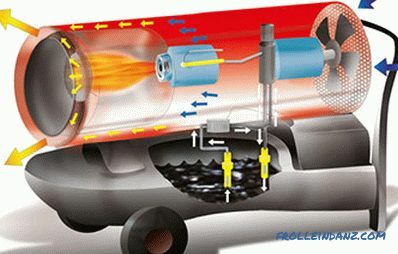 The use of low-quality or contaminated fuel inevitably leads to clogging of the nozzle and / or filter, as well as the formation of carbon on the spark plug (foreign-made heaters are particularly sensitive to the quality of the fuel).If the workers of the service center find out that the cause of the heat gun failure was non-observance of the operating rules (in this case it is a question of using low-quality or not included in the list of recommended fuels), the equipment is removed from the warranty service and the manufacturer is no longer responsible to the buyer. Heat guns that work on mining perfectly “digest” virtually any type of liquid oil — engine, transmission, hydraulic, and mixtures thereof. The exceptions are transformer oil and high viscosity lubricants. Before filling the fuel tank of the heat gun with used oil, it must be free of mechanical particles and water. 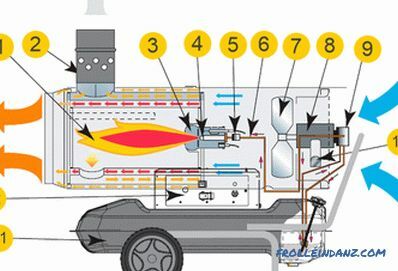 And finally, infrared heat guns can operate, depending on the model, on both gas and liquid fuel (kerosene, diesel fuel), as well as electricity. Their fuel quality requirements are the same as for the corresponding types of heat guns. When estimating future fuel costs at the stage of selecting a heat gun, one should pay attention to such a characteristic of a heating device as fuel consumption. The dimensions and weight of the heat gun depend on its type, design and power (performance). Lightweight and compact, usually used in homes and offices. Overall and heavy, but also more powerful, designed for large industrial and agricultural facilities. Electric heat guns have the most modest dimensions. Their weight can vary from 3 to 30 kg, i.e. any of such devices is obviously mobile. In addition to the ease of operation and the absence of hazardous waste and emissions, this circumstance is another argument in favor of electric guns for those who are looking for climatic equipment for domestic use. Gas heat guns for the most part are also distinguished by their low weight and dimensions. True, their mobile at the same time can only be called a stretch. The mobility of such devices depends on the source of fuel supply. 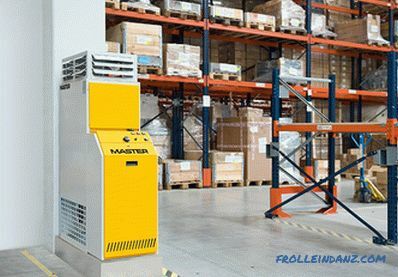 Even being the smallest and lightest gas gun, being connected to the centralized gas supply line, becomes stationary for a while - it is easy and natural to move it to the other end of the warehouse if necessary, and tomorrow you will not be able to go to the next room. Liquid-fuel (diesel and multi-fuel) heat guns, due to the fact that they have, in addition to everything else, the combustion chambers and fuel tank are the most massive and, as a result, heavy. It should be taken into account that after filling the fuel tank with fuel the weight of the device will increase significantly. By the way, the mobility of liquid-fuel guns also depends not only on their size and weight, but, in this case, on the type of device: the indirect heating guns, being connected to the stationary chimney, lose their mobility. Along with mobile heat guns, which can be moved as needed from place to place due to their carrying handles (for the smallest and lightest) or wheels (for vehicles heavier), there is only stationary equipment - in most cases it is a liquid-fuel gun. Among these are true giants, whose length, width, and height are in meters, and their weight in tons. Transportation and loading / unloading of stationary heat guns are carried out using special equipment. To accommodate very large climate equipment, it is necessary to prepare in advance a flat platform that can withstand the appropriate load (taking into account the increase in weight when filling the fuel tank with fuel). When choosing a device for heating, it is not enough just to make sure that it fits in size in the intended room. It should be borne in mind that the heat gun during operation should be placed at a considerable distance from objects and even more so from objects made of flammable and combustible materials, as well as from the usual (or the only possible) ways of moving people. 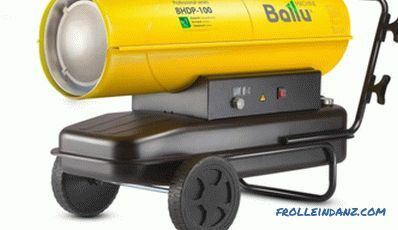 Therefore, for example, compact small-power cannons are recommended for heating small or narrow spaces. What are the ranges of power values ​​of heat guns, we now know. But while these are just bare numbers, we want to get an answer to the question: what kind of power device is needed to heat a particular room? To match the capabilities of climate equipment with existing needs, you need to learn how to calculate thermal power. 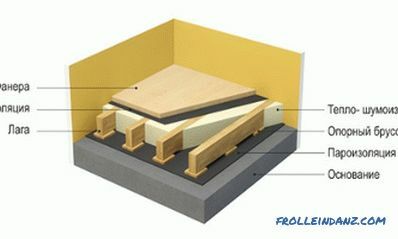 Room volume .It is the volume, since the area is not very indicative when solving heating issues. 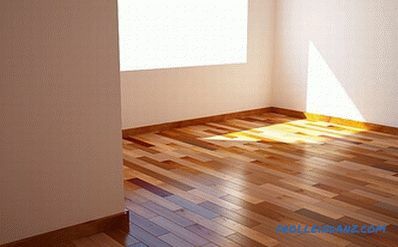 The fact is that warm air, being lighter than cold, rises, so you will inevitably warm the entire volume of air in the room, and not just its lower layers, where the heat gun is located. Temperature . Not even one indicator is of interest, but two at once (or rather their difference): the temperature outside the building and the temperature that must be reached indoors. It is clear that the reading of the thermometer "overboard" can fluctuate greatly during the season, therefore it is important to correctly estimate the average minimum temperature and the magnitude of its jumps in your region. When choosing a value indoors, it is necessary to be guided by the requirements of SNiP, according to which the temperature, for example, in public buildings and production workshops should not be below +18 0 C, and in warehouses - no less than +12 0 C. However, if you choose a heat gun for private use, you can decide for yourself whether you are ready to tolerate discomfort when it is very cold outside, or whether you need to buy the device with a reserve by all means. k = 3. 0-4. 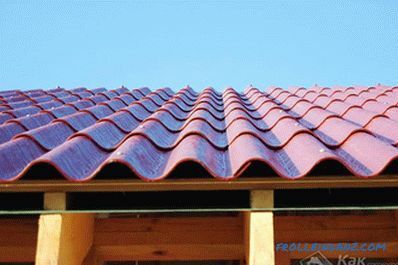 0 - the absence of thermal insulation (simplified wooden or made and corrugated metal sheet construction - sheds, hangars, etc., as well as open and semi-open areas). The coefficient k given here is the heat dissipation coefficient characterizing the quality of the insulation of a building / room. You will have to choose a specific value from the specified range of values ​​of the coefficient k on the basis of the complete information you have about the structural features of the building. ΔT is the difference between the temperature required and available outside the room (in degrees Celsius). Please note that the value of heat output obtained using this formula is calculated in kcal / h. To translate them into the usual kW (in these units, as a rule, the heating power of heaters is indicated in the accompanying documentation), it is necessary to divide the obtained value by a factor of 860 (1 kW = 860 kcal / h). 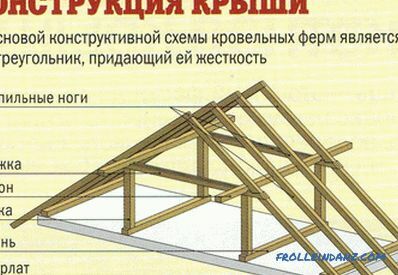 Heating of a 24-square-meter garage is required. meters with a ceiling height of 3 m (single brickwork, no windows, the doors are insulated poorly); the required temperature inside the garage is +15 0 C, the average temperature in the street is -25 0 C.
t. E. To fulfill the specified conditions requires a heat gun with a capacity of at least 8-8. 5 kW. In conclusion, I would like to make a couple of comments on the issue at hand. Firstly, such calculations are correct only if the heat gun is the only source of heat. If there are already some other sources of heat in the room (for example, a central heating system), then the calculation should take into account these available thermal capacities. Secondly, it is not necessary to buy one heat gun of calculated power - you can purchase two or even more devices, the total power of which will be equal to the calculated one. As a rule, heating a room with a few low-power appliances is more efficient.This recommendation is especially important for those who require heating of a large area and / or a complex configuration. Are stretch ceilings harmful to health? How to put crates and sheets?